Melancholic Art - the resistance of satanism in a chaotic world, was born in the middle of 1999 (in the "false" calendar), founded by M. A. Anwar. With the proposal to play doom metal, strongly influenced by black metal with lyrics about paganism and a direct ideology: Antichristianism, declaring war against the church. In 2000. the drummer M.A. Lord Demon Joo joined the horde. Both of them were the first professional line-up of Melancholic Art. Soon, in 2001 they released a demo called The Son of the Moon, with two hymns about the night and Metzli. This demo got a great response by the fans. In the same year, Melancholic Art released an EP titled Following the Dark Prophecy, with huge melodies, this release could show the way that the horde would follow, a satanic, obscure and macabre one, where the evil dominated. In the following three years, the horde had some line-up and musical changes. 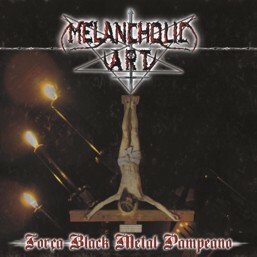 Melancholic Art released their biggest example of hatred and evil devotion, the debut Fora Black Metal Pampeano, the most agressive album so far, an apology to war, confusion and disaster. It couldn't be left aside the regional traditions, therefore they are really strong and would be a disrespect to ignore them since the members grow and live with them, something which will never be forgotten. The members don't carry political themes to the horde, and don't give boundaries to their sound. For them, black metal is an alone flag, indifferent to state or country, respecting who have the real black feeling inside, people who live this daily. Melancholic Art wait for the end of times, where the weak human race will be extinguished and reduced to dust. They don't see a form of life in this world and during this waiting they will be always practicing their ideology, and be part of the soundtrack of apocalypse. Christians and all kinds of religious people can wait the worst coming of the purest abyss, where the curse is always awaken, coming from the emptiness where just the dead surround, guide and protect us with the supreme black aura of evil. In the last years, Melancholic Art had a great musical matureness and changes that can be noticed after each release, but what won't be change is the horde's idelogy. Due to ungrateful musicians with lack of respect to the horde' leaders, they had to change the line-up sometimes to work in a professional way. Melancholic Art is the extension of the members' lives, for them there is no music without feeling, that's why they play with their own souls. They are the most hateful brazilian antichristian black metal. Death to the followers of christ and long life to profane black metal!